Join the Center for Latin American Studies (CLAS) in welcoming Fr. Francisco de Roux, president of the Commission of Truth, Coexistence and No Repetition in Colombia. Fr. de Roux will talk about the integral system of transitional justice that is being built in Colombia, which is the first of its kind and could serve as a model for other countries recovering from decades of internecine conflict. He will also share lessons gathered from his experience as president of the Truth Commission and as a long-time advocate and supporter of the peace process in Colombia. Fr. 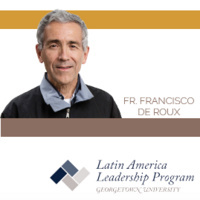 Francisco de Roux, S.J., is a Colombian Jesuit priest and president of the Commission of Truth, Coexistence and No Repetition in Colombia. This event is sponsored by CLAS and the Latin America Leadership Program (LALP). Lunch will be provided. Email the event organizer at clas@georgetown.edu to notify us of any accessibility requests and/or dietary restrictions. A good faith effort will be made to fulfill all requests.